Monday November 6th 1893 I did some writing in the evening after my work was done and went up town before noon. Will went to the valley for a load of wood for us. Mrs Fuller and I rode over home to spend the afternoon. Fanny is not well. I feel better today. The weather is very pleasant. Tuesday November 7th 1893 Will helped me wash before he went for wood. It was late when he came to dinner. I washed the windows in the dining room and cleaned the garret. It was nearly night when I got through. There was a Worlds Fair entertainment at the Presbyterian Church. I went with John and Will came after me. Mrs Fullers Mother stopped today on her way back home. 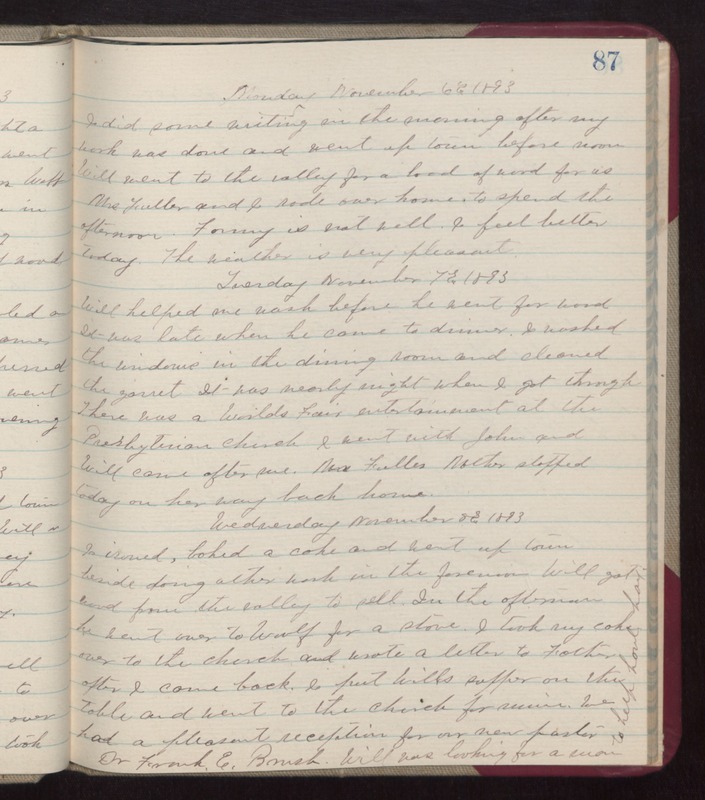 Wednesday November 8th 1893 I ironed, baked a cake and went up town besides doing other work in the forenoon. Will got wood from the valley to sell. In the afternoon he went over to Woolfs for a stove. I took my cake over to the church and wrote a letter to Father after I came back. I put Wills supper on the table and went to the church for service. We had a pleasant reception for our new pastor Dr Frank E brush. Will was looking for a man to help haul hay.